The less developed Central region of Viet Nam harvests distinct cultural values and natural masterpieces largely unknown to outsiders. Quang Binh Province is high on the list of places to visit. 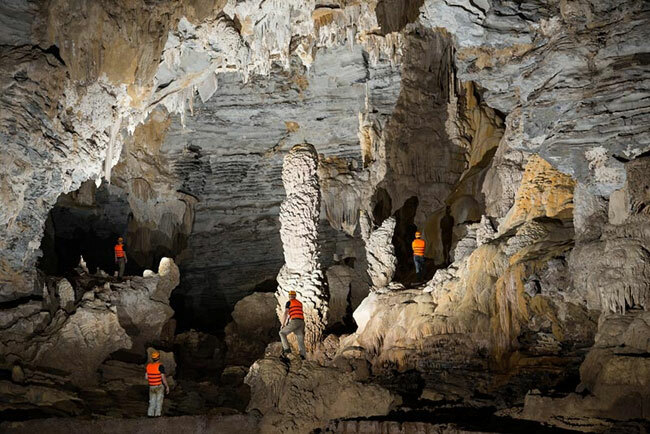 Its cavern system has recently stunned discoverers around the world with its magnificent and pristine landscape. Last year, the province opened the Son Doong Cave, which has been recognised asthe world's largest cave, instantly catapulting it onto the bucket lists of travellers around the world. The cave's entrance was first discovered by a local man in 1991, and was further explored by a group of cavers from the British Cave Research Association in 2009. This was the third cave to be discovered in the central province – an expansive karst area buried deep in the jungle. The cave is said to have been created two to five million years ago with river water eroding the limestone underneath the mountain. It is also described as having enough space to house 40-storey skyscrapers and trees 100-feet tall. But Son Doong is not the province's only cave. 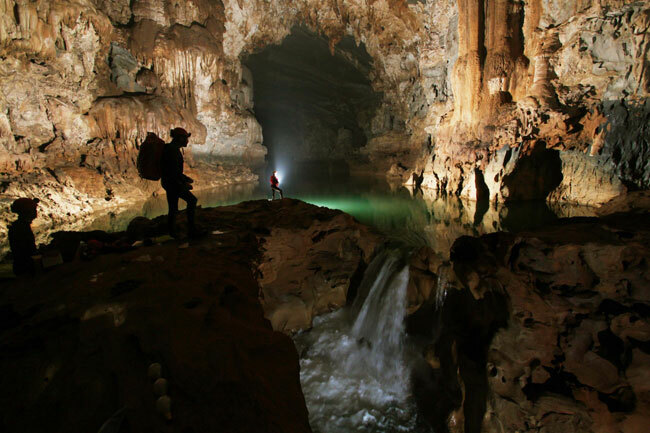 A surveying trip to the Son Doong led the cavers to find another cave, Tu Lan. The new discovery revealed a cavern system of smaller caves, including Tu Lan, Ken, Tien, Chuot, and Kim that were found in 2013. Thien Duong Cave, revered by cavers for its length, was discovered in 2005, while Phong Nha Cave was discovered in the feudal period. While Phong Nha and Thien Duong are located in the heart of Phong Nha - Ke Bang National Park, a UNESCO-recognised nature heritage site, Son Doong and Tu Lan are more spread out, located within 80km of the park border. Diversity in cave conditions, which can be either wet, dry, small or large-scale, helps offer a diverse range of caving tours in the province. Most of the locals and visitors from Asian countries prefer Phong Nha and Thien Duong, because they offer shorter and more convenient cave tours suited to shorter visits. Westerner explorers have been shown to be avid explorers of Son Doong and Tu Lan caves, opting for tours which include adventurous hikes. To explore these caves, visitors are required to trek deep into the jungle and spend a night in the forest. Caving tourism has recently made Quang Binh, previously a lesser known destination in Viet Nam, a hot spot for visitors from around the world. 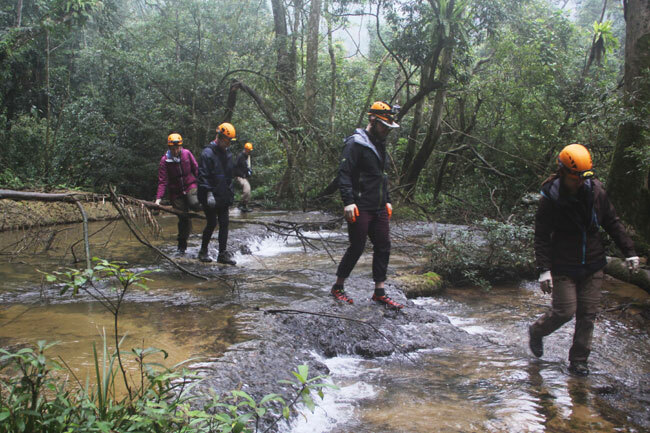 According to Oxalis Company Limited, the sole provider of tour programmes to Son Doong and Tu Lan, a tour can cater only to a group between two to eight people. Each visitor is educated on helping to preserve the pristine state of areas visited on the trip, to ensure the area's longevity. The company also hopes this will create a long waiting list of travellers wanting to experience the caves. To reach Phong Nha, the base of the company's headquarters, for the tour to Tu Lan cave, visitors have to arrive in Dong Hoi Town first, between Hue City and Ha Noi. Oxalis transfer visitors to the site, which is around 70km outside of the town. The company provides van services for passengers arriving at any time of day at the bus station, railway station or airport. Everything is available in Phong Nha, including meals and reasonable hotels for a night's stay before starting the trek early in the morning. A van then carries passengers to a village near the base of the mountain to prepare vital necessities required for the trip. They then begin a walk across the corn fields which separates the rural hub from the jungle. First, visitors conquer a low shoulder of the mountain before reaching a higher mountain to Hung Ton Cave. The mountain leads to an entrance "down to hell" on a wooden ladder. This is where the search for the cave begins. The second challenge requires swimming upstream in water that runs inside Kim Cave. The temperature is always lower inside the cave compared to the average temperature outside, especially under the water. However, swimming with your head above water allows visitors to enjoy a spectacular view of the cave's interior, illuminated by head-torches. At the upper end of the stream awaits a spectacular waterfall, where trekkers will feel like that have discovered an alternate universe. After a short walk, the trip continues to Ken cave, a wonderful wet cave in the system. Explorers then arrive at a camp site for a barbecue and a night around a camp fire. John Bailey, an American visitor who took part in a Tu Lan tour, said he was fascinated by the natural beauty of the cave. "I knew Viet Nam for its cultural heritage value and it is amazing to find out that the country has this natural beauty. The caves are so wonderful and I think everyone should have the chance to visit at least once in their life," he said. Bailey was also struck by how well preserved the caves were, saying he was confident they would be enjoyed by future generations. In the morning, visitors trek to Tu Lan before climbing over four mountains to get back to Phong Nha. The trip is serviced by caretakers, who act as guides and porters. Safety is also a priority, utilising the finest equipment from Europe. Nguyen A Chau, the company's director, said the Tu Lan trekking is the best substitute for the Son Doong tour, which is fully booked to 2015.